experience in microbiology—we have what you need for the application you are teaching. Choose the option that works for you—bottles, plates, tubes, or dehydrated media. 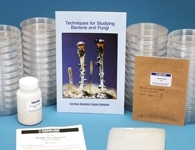 Shop now from our vast selection of of quality microbiology supplies and cultures.